The world’s most powerful future space telescope arrived in New York City as part of the World Science Festival. NASA’s James Webb Space Telescope will allow us to unveil the very first galaxies formed in the Universe and discover hidden worlds around distant stars when the mission launches in 2014. For six days in June, a full-scale model of this successor to the famed Hubble Space Telescope was on public view in Battery Park. The model, at 80 feet long, 37 feet wide and nearly 40 feet high, is as big as a tennis court. It’s as close to a first-hand look at the telescope as most people will ever get. There was more to do than just marvel. 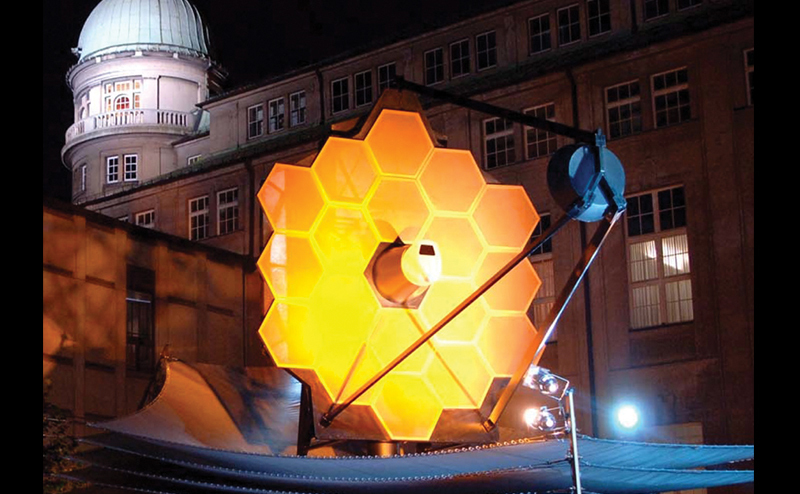 Once visitors took in the awe-inspiring sight, they could play with interactive exhibits, watch videos showing what we will learn from the Webb, and ask scientists on-hand about how the telescope works. The Webb Telescope was also the site of our Friday June 4th party, “From the City to the Stars,” where leading scientists joined us to talk about the anticipated discoveries. Visitors were encouraged to bring their telescopes if they had one, or could to use one of the dozens we had on hand. Amateur astronomers and novices alike congregated for a festive evening of marveling at the wonders of the cosmos. This program was made possible with the support of Northrop Grumman, and presented in collaboration with The Battery Conservancy.